This interface is used to connect a hand-portable radio to a Green-Go digital intercom system. The interface communicates over the network with other Green-Go intercom stations, where each station is connected to a network switch using standard Ethernet cabling. 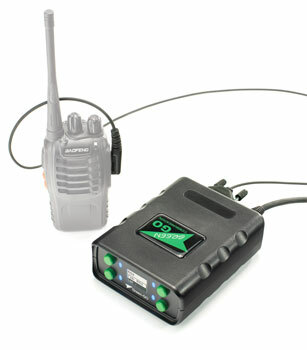 The RDX Radio Interface offers a user-friendly way of communicating with a number of external radio (walkie-talkie) users. The RDX provides all necessary A-D and D-A conversion, audio processing and switching of transmit/receive functions, ready to connect with a dedicated cable to a 'captive' radio transceiver, which then provides simplex communication with a number of 'mobile' (connected by radio) transceiver users. In this way a single radio channel provided by the captive handset becomes a single dedicated group on the Green-Go network. A single 9-pin female D-sub connector on the rear of the RDX provides audio input/output connections as well as closing contacts to control the captive transceiver; the link cable connects to the microphone input socket of the captive transceiver to send audio and the headphone output socket feeds audio back to the RDX interface and hence on to the Green-Go network. The default state of the captive transceiver is to receive, so audio from the mobile users will be injected on to the Green-Go network. When someone on the Green-Go wired intercom system broadcasts to the 'Radio' group, the RDX Interface automatically closes a 'PTT' relay which triggers the captive transceiver to start broadcasting and send audio to the mobile users. (PTT: Press To Talk). On the rear of the RDX Interface, in addition to the D-sub connector, there is an Ethercon connector to connect to the network switch for both Ethernet data and for the delivery of PoE. Two switches provide coarse level settings for the audio sent to the captive transceiver. The front panel has a full colour OLED screen which displays device functions and settings. Four buttons are used to access the RDX menu where all adjustments to settings are made. Power source: Power over Ethernet (POE), 802.3af Standard. Dimensions: 145 x 85 x 30mm. Weight 400g. The captive radio transceiver should be kept at a distance of around one metre from the RDX Interface, to avoid interference. When using simplex intercoms some discipline is required. Saying 'over' when the user has finished talking is good practice.